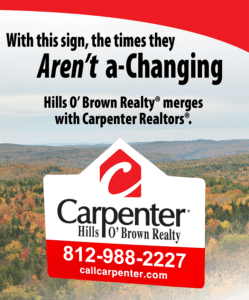 The merger of Hills O’ Brown Realty with Carpenter Realtors® was announced today by David Caveness, President of Carpenter Realtors® and Frank Zody, Owner of Hills O’ Brown Realty. The combined/merged operation will continue to operate from the Nashville Office location at 158 Jefferson Street N., that Hills O’ Brown Realty has enjoyed for many years. “This merger symbolizes our continuing confidence in and our commitment to the Brown County market place,” said David Caveness, President of Carpenter Realtors®. “Hills O’ Brown Realty has been the dominant real estate brokerage in Brown County for many, many years. They have always been very professional and have a strong history of providing great service to their clients. We are truly pleased to now be working with them. The combination of their skilled Associates and our exclusive Home Marketing System will not be matched”. The Hills O’ Brown Realty Managing Broker, Tom Vornholt, will continue as the Branch Manager of the Nashville Office. He has been associated with Carpenter Realtors® in the past and is excited about this merger. What does this mean to existing Hills O’ Brown Realty’s loyal customers and friends? Not much. Carpenter Hills O’ Brown Realty® will be managed and staffed by the same team of real estate professionals they’ve always known and trusted, at the same location. What’s new? Besides a new sign, the Hills O’ Brown team can now offer Carpenter’s exclusive multi-media Home Marketing System. It reaches more potential buyers for a home or land throughout central and southern Indiana. More marketing can mean a home can sell faster, for more money and with less inconvenience. Also, there are now nearly 700 Carpenter Realtors® agents who are more excited about selling Brown County listings. The Carpenter Hills O’ Brown Realty team still live here, still work here. Our customers are our neighbors. No one knows the Brown County Indiana real estate market better than the Carpenter Hills O’ Brown Realty® team. Is someone is looking for a Brown County home, wooded acreage, investment property, condominiums or commercial property, the full time professionals at Carpenter Hills O’ Brown Realty® will continue to meet their needs.